Who says you have to live on a farm to be a farmer? With Water Garden from Back to the Roots, you don’t need so much as a patch of grass to grow your own food. All you need is a sunny indoor spot and a Betta fish to get started. Water Garden even comes with organic seeds and a Betta fish coupon. No soil and no chemical fertilizers necessary. 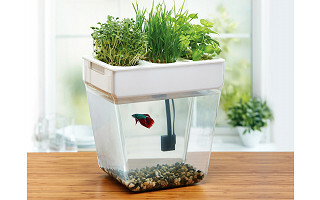 This self-cleaning fish tank that grows food is based on the theory of Aquaponics. Sounds scientific, and it is. But it’s also surprisingly simple. Basically, the fish feed the plants, the plants clean the water, and people of all ages from kids to adults marvel as science sprouts to life. (Scientifically speaking, Aquaponics is the symbiotic cultivation of plants and aquatic animals in a recirculating environment.) The brains behind this self-feeding, self-cleaning, at-home Aquaponics system are Back to the Roots co-founders Nikhil and Alejandro. Their passion for turning natural waste into food began with their Grow-Your-Own Mushroom Kits (also a Grommet) that use coffee grinds in place of soil. The power of natural waste isn’t the only thing these guys are passionate about. They also believe in manufacturing in America. That’s why they make AquaFarm in their home state of California. 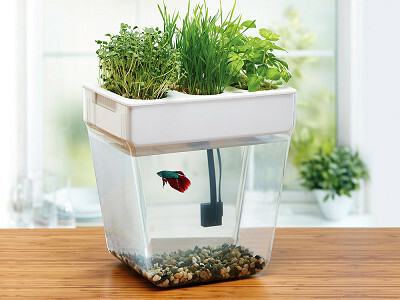 With Water Garden, it doesn’t have to be summertime and you don’t have to have a green thumb to grow your own plants. You can enjoy homegrown greens without lifting a single garden-gloved finger. We're really excited to partner with The Grommet to bring you our AquaFarm! Back to the Roots is all about helping families connect with their food in a way that's fun and sustainable (not to mention delicious)! Happy AquaFarming and look forward to answering your questions. does it need an electrical outlet? Yes it does need an electrical outlet. It uses a 2 prong plug. Why us there an apparent air space above the water? Doesn't that keep food away from the fish. What is in the bottom of the tank.....fish excrement? Does this unit need electricity? @Gail From my understanding, a Betta fish does not "breathe" through gills underwater like other fish. It breathes actual air, so it needs to come up to breath and then goes back down to the water. Hence the air pocket for the fish to breathe. 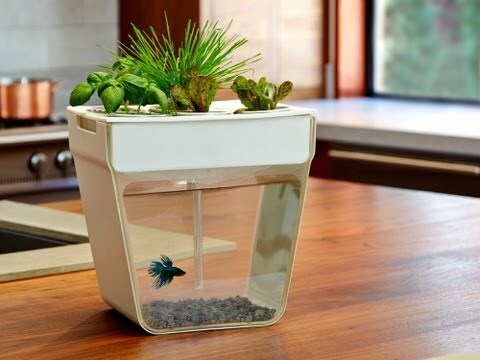 I have been following all of the Aquaponic ideas...hydroponic etc.. have friends in CA that put them in their counter tops. Is there an option for you guys to come out with one like the "Kitchen Nano" it is not yet here in the U.S. but I like it way better than the "Juice Plus" Tower..... it is inside and can be connected like a refrigerator etc.... I have a LARGE family and would be willing to pay for a "Kitchen Nano".. even considered converting an old glass drink machine... but if you guys come out with something like it my friends and I would buy it. Your product is awesome and can't wait to purchase it! Do you need to feed the fish separate food, or is that all part of the system? @Sabrina Yes, that's the part that you would still need to do. The AquaFarm comes with about 3 weeks of fish food. What keeps algae from growing in the tank? @Corrine Like an aquarium the AquaFarm could develop algae as a result of the combination of excess nutrients in the water and sunlight. Being careful not to overfeed your fish is one way to prevent nutrients from building up. If your AquaFarm is in a spot that receives very direct sunlight, this is great for the plants, but not the tank water. In this situation, consider putting a back panel over the tank side to prevent sunlight from hitting the water. Another solution is to visit your local pet store and pick up one or three algae-eating freshwater snails. They'll happily clean your tank for you! Hope this helps! @Siddharth Yes it does! We have two fish tanks and an outdoor pond so I wanted to be realistic about the maintenance. But I will definitely buy one of these! @Corrine Thanks so much for your support! Once it's all set up and cycled through (a couple of weeks), I think you'll be pretty happy with just how little maintenance is required. What about feeding the fish? @Guest Yes, you would definitely need to feed the fish. The AquaFarm comes with about 3 weeks of fish food. What types of seeds come with this kit? @Julie It comes with three packets of organic seeds - all of them contain wheatgrass but some also contain a combination of basil and lettuce. I live in sunny socal and my betta fish was very sad and lethargic until I added a heater. Do you have heat built into this system or will this be something that can be accommodated for in your tank? @Tammy The AquaFarm does not have a built in heater but you should be able to use a heater with the system. You'll just need to pick one that fits in the tank. Does the house have to be maintained at a certain temperature for the fish/water/plants? It gets pretty cold in the house in the winter. Is there a level of sunlight needed? @Guest Wheatgrass is pretty hardy and can withstand a wide spectrum of sun and temperature. You would need to look at the ambient temperature and sunlight requirements for the seeds you are planting. Similarly with the fish - we recommend the Betta and it does best in a temperature range of 76-82 degrees F since they are tropical fish. We have about 50 tanks in our office and they are all at around 70F and are doing ok. Like any aquarium, if you have a lot of sunlight, you would want to make sure to put a backing on the tank to prevent algae. What materials are used to make this product? Hi Gale, it's designed and made here in the U.S. from a combination of materials. I've emailed Siddharth to ask specifically and will have an answer for you shortly. The tank is made with an aquarium grade acrylic that is BPA/phthalate-free. The grow bed and grow lid are made out of polypropylene that is also BPA/phthalate free. And the shroud that goes over our tank to cover two of the sides is made of ABS - BPA/phthalate-free. Who says you have to live on a farm to be a farmer? With Water Garden from Back to the Roots, you don’t need so much as a patch of grass to grow your own food. All you need is a sunny indoor spot and a Betta fish to get started. Water Garden even comes with organic seeds and a Betta fish coupon. No soil and no chemical fertilizers necessary. 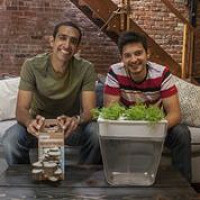 The brains behind this self-feeding, self-cleaning, at-home Aquaponics system are Back to the Roots co-founders Nikhil and Alejandro. Their passion for turning natural waste into food began with their Grow-Your-Own Mushroom Kits (also a Grommet) that use coffee grinds in place of soil. The power of natural waste isn’t the only thing these guys are passionate about. They also believe in manufacturing in America. That’s why they make AquaFarm in their home state of California.